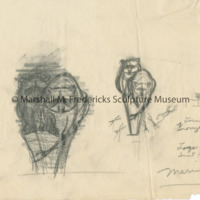 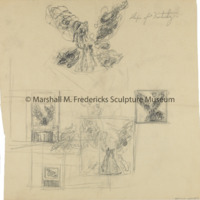 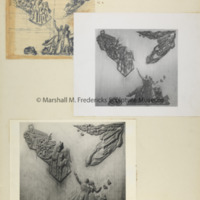 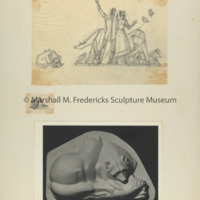 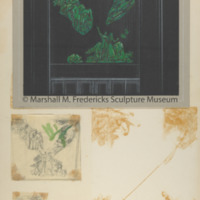 Sketches of "Raccoons" for the "Spirit of Kentucky"
Collectively titled the Spirit of Kentucky, Barry Bingham, editor of the Louisville Courier-Journal commissioned Fredericks to design reliefs for their new building. 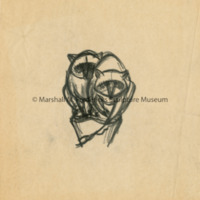 Sketch for "Raccoons" from the "Spirit of Kentucky"
Presentation drawing and sketch for the "Spirit of Kentucky"
Sketch for the "Spirit of Kentucky"
Sketches for the "Spirit of Kentucky"
Fish plaster section of Raccoons relief. 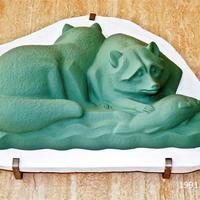 This section has one of the raccoon paws on it. 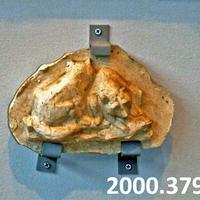 Plaster relief of two raccoons depicted with a fish. 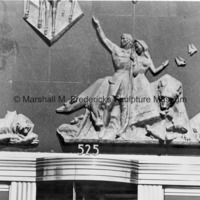 The relief was part of the "Spirit of Kentucky" , Courier-Journal Building in Louisville, Kentucky. 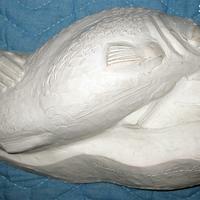 Close-up view of bronze "Spirit of Kentucky"